I'd vaguely heard of these home-maintenance things called snow roof rakes, but didn't really know why one would need one. Well, now I know. It's so you don't have a little rain shower in your living room, thereby necessitating an afternoon outside in the rain, atop a ladder, swinging an ice axe. Apparently the snow on the roof can melt and freeze into an ice dam. This ice dam will of course grow into the gutters, and if it's large enough it will cut off the exits for melted snow behind it. Water pools on the roof under the snow and ice, and eventually finds its way inside. Our trouble spot (yes, this happened once before, but I managed to push it out of my mind) is the triple window in our family room. 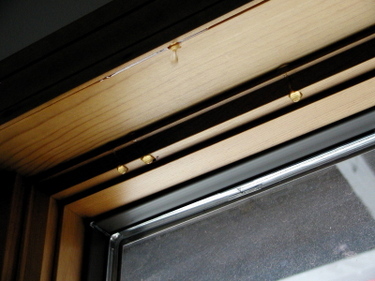 The water must be dripping down inside the walls, and it collects in the window sashing, completely saturating it. The sashing then drips water from every seam. We have employed a steadily growing army of plastic cups to catch the drips, but it quickly became clear that we'd have to address the source of the problem. So as soon as S returned home from skiing, we marched outside, balanced ourselves atop ladders, and chipped away at the offending ice. Luckily S has a pair of ice axes from his ice climbing days, it would have been a much worse job without them. 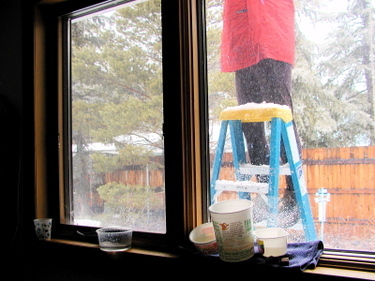 (We did this even though all the ice dam removal pages we found through google said "don't chip away at it!" What can I say, we were desperate.) Let me also say, ice axes are really sharp and pointy, and I've been known to make glancing blows at myself accidentally with the backsides of hammers, so this really intimidated me. Not to mention the fact that the ice shatters and flies everywhere when you hit it, which conveniently happens to be at eye level for me. So I donned my ski goggles, which made it so much better. We must have been quite the sight for the neighbors. The dripping has slowed now, we're sitting around with crossed fingers and umbrellas. I knew where this was going as soon as I saw you (is that you?) swinging away at the gutter. We had ice dam problems in Michigan once, and resorted to pouring boiling water on them (I'm sure that wasn't recommended either). Thanks for the memories! and watch out for those ice axes. is this what they mean when they talk about the joys of home ownership? where I live, we average 180 to 200 inches of snow per year. un-raked roofs have been known to collapse! Oh yes, we know from roof rakes and ice dams. 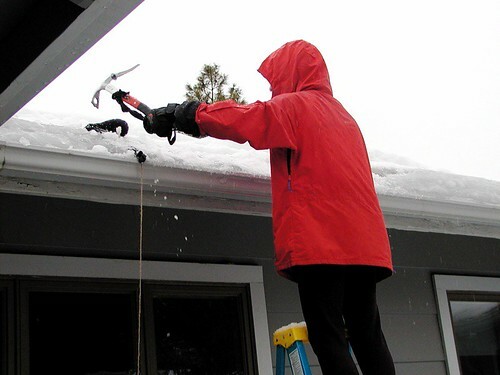 If your roof lets any heat escape (and just about allof them do) and there is snow on the roof, then snow will melt and run off until it reaches the unheated eaves - where, if it's cold enough it will freeze and eventually build an ice dam. Then the melted snow will back up under theroof shingles and find its way into your house. The only economical way to stop this is to buy an extendable roof rake and rake the snow off of the roof after each storm. You don't have to do the whole roof, just a good swath above the eaves. Roof rakes - yes! We got ours last year when the Denver area had unusually massive amounts of snow. Now, to keep this from happening in the first place, let me suggest looking into heat tape for roofs. We used to have some on the north side of our home but took it down when we were getting a new roof. This year we got a bunch and put it up there. It zigzags along the roof near the gutters. Not the prettiest but it sure works to keep ice dams from forming. Hubby put it up on the roof and then dropped it down the downspout. When it snows we plug it into an outdoor outlet on the side of the house. We'll remove it in the Spring. ugh, we used to have this same problem. everytime it snowed a fair amount and then it would heat up from the heat coming thru the roof, would start to melt. Into our bay window. which usually happened at nite, so the hubby usually didnt like to go climb up there at nite. so he would have to get up extra early to shovel the roof! thankfully we no longer live there!!! !